Your ankles have a big job to do. Not only must the support your weight without collapsing, they also have to allow your foot to move. If they give out or don’t bend and flex to allow foot movement, you aren’t going anywhere. Unfortunately, this means any type of ankle pain can have a profound impact on your mobility. Ankle pain is a symptom for several different conditions. Exactly what your discomfort is and what caused it will vary from case to case. One of the most common culprits is, of course, an ankle sprain. This sudden over-stretching of stabilizing ligaments is painful and leads to swelling, stiffness, and loss of movement in the joint. Though it’s one of the most common injuries, this isn’t the only reason your ankles may hurt. Other injuries can damage the joint and cause pain. Sometimes soft tissue injuries like Achilles tendon problems, peroneal tendinitis and bursitis can contribute to joint discomfort. 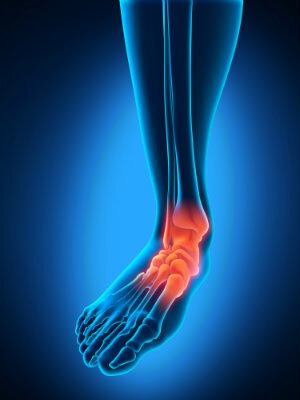 A fracture in the talus, the ankle bone, can cause severe pain and stiffness. Without proper treatment, it could lead to permanent changes and issues in the bones, too. Arthritis in the ankle is a fairly common source of discomfort and stiffness as well, especially after a major injury like a fracture. Another common problem is an untreated sprain, or repeatedly injuring the same ankle. Both situations can lead to chronic discomfort and weakness. If the ligaments around the joint don’t heal properly, or they keep getting damaged, they can become permanently loose and ineffective. This is both uncomfortable and opens your ankle up to future injuries. Exactly what you should do for your ankle pain will depend on the underlying problem that’s causing it. The best way to get the accurate treatment that your lower limbs need is to get your foot checked. Dr. Noah Levine will carefully examine your joint. Our team may need to use tests and diagnostic images to look for the specific problem. Then we can help you identify what your lower limbs need for treatment. Treatments can range from immobilization to physical therapy, depending on your needs. The most important method, however, is rest. Take a break from anything that causes ankle pain to avoid stressing the joint and let everything heal. If you have a broken ankle or a sprain, you might need to keep your joint still for a while. Icing and elevating the foot can help address any swelling and inflammation. Once the joint is on the mend, physical therapy help rebuild strength and condition your limbs to handle strain again. In rare cases, conservative therapies might not be enough. Surgery could then become an option to repair the damage. Ankle pain can easily be debilitating if it’s not dealt with appropriately. You do not have to wait for it to get to that point, though. It’s much better for your feet and your activities if you deal with any pain quickly, before a problem has time to deteriorate. Our team at Absolute Foot Care Specialists in Las Vegas will help you. Make an appointment at one of our offices by calling (702) 839-2010, or by using our online request forms.